Imagine an engrossing book “about” jazz that has very little to say about the music. None of the usual content or digressions: anecdotal stories of musicians; portraits of club owners, record producers, concert impresarios. No one’s mother plays the organ; no one has a loving mentor or a horrible first gig. 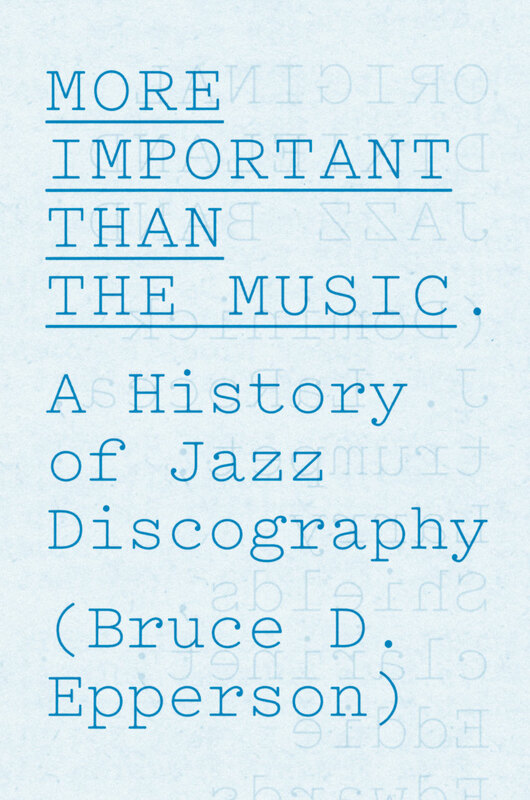 But the book, MORE IMPORTANT THAN THE MUSIC, by Bruce D. Epperson (University of Chicago Press, 2013) is an intriguing study of something most people involved in the music in more than a casual way find invaluable: discographies. A discography, for those new to this, is an essay — or book-length — or a dozen volumes — or an online source — that documents the recorded history of this music. As a bibliography (at the end of your fifth-grade report on The Eye) lists the works consulted, a discography seeks to present all the information known on these recordings. It can be limited to one artist, a span of time, a style or genre, or it can attempt to be encyclopedic, comprehensive. Before jazz existed, of course, there were catalogues of compositions — think of the BWV numbers or Kochel numbers for Bach or Mozart. But it was only when listeners and collectors began seriously to both amass and study recorded evidence — artifacts of performance — that the idea and the actual realization of discography came into being. Why were discographies desirable or necessary? When jazz performances were issued on single discs, often without the individual players listed on the label, one couldn’t be sure who the Kentucky Grasshoppers or Lil’s Hot Shots were. One could trust one’s ears, but that method has often led to what I would call Collector’s Enthusiasm, where every muted trumpet solo had to be by King Oliver; a vague aural shadow of saxophone on a 1934 Clarence Williams record — could that be Lester Young? So, at first, they were lists created by collectors, then made public as more widespread enthusiasm about famous and obscure recordings developed. Then, discographies could serve an ideological purpose: all the recordings in these pages have notable “jazz interest” (translation: they reflect my aesthetic values); they could be divided along racial lines to reflect theorizing about the development of an art form. From more balanced perspectives, they could reflect much about the ways in which art was made public, and tell a great deal about individual artists or groups. Epperson’s book deals adeptly with the ideas behind the varieties of discographies, and he does so by specific reference — tracing the changes in the form through specific publications and the writers / researchers responsible for them. This might, to the uninitiated, seem like a scriptural list of begats beginning with R.D. Darrell, but the creators themselves seem to have been at best energetic, at worst acrimonious. There are many small contentions documented in this book: questions of accuracy, of plagiarism, of theory and practice. Epperson’s story begins in England, takes in France and New Orleans, digresses most pleasingly into the phenomenon of “field recordings” and the changes brought in discography and record collecting by the long-playing record, and comes up as close to the present as possible. I was amused and pleased to see jazz scholars I know and admire depicted in these pages: Jan Evensmo, Manfred Selchow, Robert Rusch. Epperson concludes with some deep philosophical questions (with commentary by Michael Fitzgerald, who knows the field deeply): in this new world, where it appears that everything one wants to hear can be heard in digital format, stripped of its evidence, what effect on discography as a scholarly endeavor or a music-lover’s act of reverence? And for the twenty-first century listener who can have all the issued and some unissued recordings of The Bohemian Stompers in one neat multi-disc set, are comprehensive discographies necessary or are they an antique manifestation of the urge to have all the rarities in one place? Incidentally, the title isn’t Epperson’s point of view — it comes from a 1947 article by Ernest Borneman, “The Jazz Cult.” The book has useful illustrations of pages taken from the respective discographies, generous footnotes and bibliography. I think this book will have a lasting place in the libraries of many jazz enthusiasts and collectors, and I can see it treated with equal pleasure and respect in graduate programs in library science. But that makes it sound too serious. Epperson is a lively, witty writer, and although he tends to fairness to all sides so thoroughly as to occasionally seem diffident, his sharp observations are a real pleasure. If anyone comes to you and asks what you are doing, for the love of goodness, with those records or compact discs, feel free to offer that answer. Jazz records are, if nothing else, sanitary, and thus laudably safer than other objects by which we might amuse ourselves.